When it comes to developing applications within the microservice architecture, the number of microservices can grow quickly. Managing microservices becomes harder with each new or updated microservice. When an application experiences a slowdown and its »data flow« goes through several different microservices, pinpointing the exact location of a slowdown may be difficult for a developer. 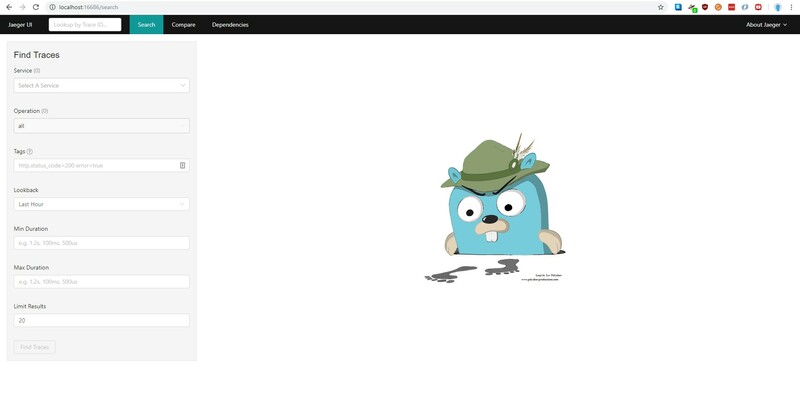 This blog post will cover the basics of distributed tracing. It will demonstrate the usage of KumuluzEE OpenTracing extension with Jaeger to fight the challenges mentioned above. Before starting with actual code and guide, let us start with a brief explanation of what tracing is. 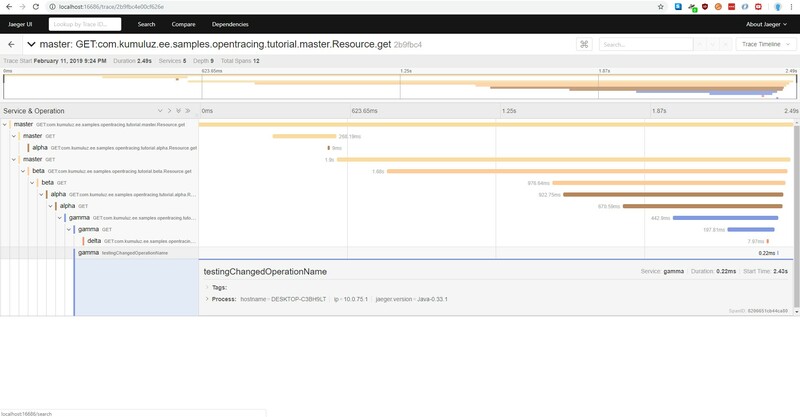 Told bluntly, tracing is a way to track a request from its starting point through the entire network of microservices. In a typical Java microservice application, the »chain« starts either with frontend or API making a REST request to some entry microservice. That microservice then handles the request (usually with JAX-RS) and queries other microservices, databases or external applications. As we can see, the number of requests inside the network increases and spreads out throughout multiple different destinations (especially in large applications). This is all good and fine, but when a problem occurs, a developer must go through a lot of logs (produced by selected logging framework, such as Fluentd or Logstash – in KumuluzEE you can use the KumuluzEE Logs extension to simplify logging) to find the problem. If a problem is severe (such as a complete crash), a solution is usually discovered quickly or even handled automatically by some container orchestration tool (such as Kubernetes). Tougher problems are the slowdowns in which the application still works but in a limited capacity. This is where the tracing comes in. When implemented across the entire application, entire request flows are saved and presented to the user in an easy to use graphical interface. The base unit is called a span. A span can be an incoming or outgoing request; execution of a Java method; access to the database, etc. Each span contains basic information such as name and timestamps (additional data can be added within the code). Spans are related to each other (children, nested spans) and together form a »trace«. More detailed analysis can be made by joining microservices and their relations to a graph. In conclusion, a trace is a sequence of events, called spans, which describe a path through the application. 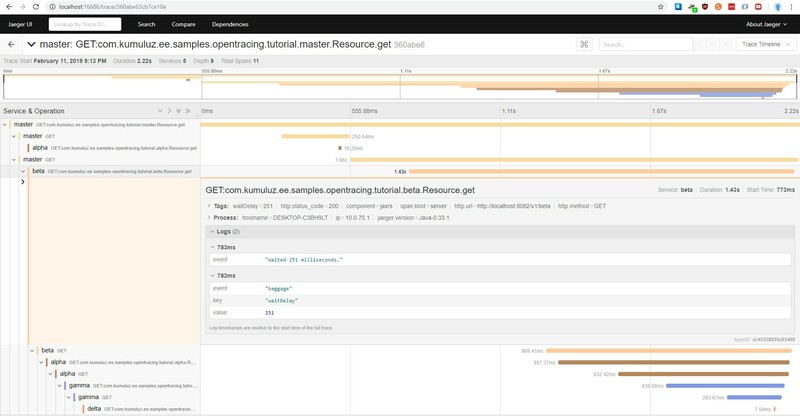 KumuluzEE OpenTracing was released as an extension for the KumuluzEE framework. It is a part of MicroProfile specification. We will demonstrate how to add Jaeger tracing to an existing KumuluzEE application using the KumuluzEE OpenTracing extension. The whole process will be demonstrated step by step with included screenshots of each step. 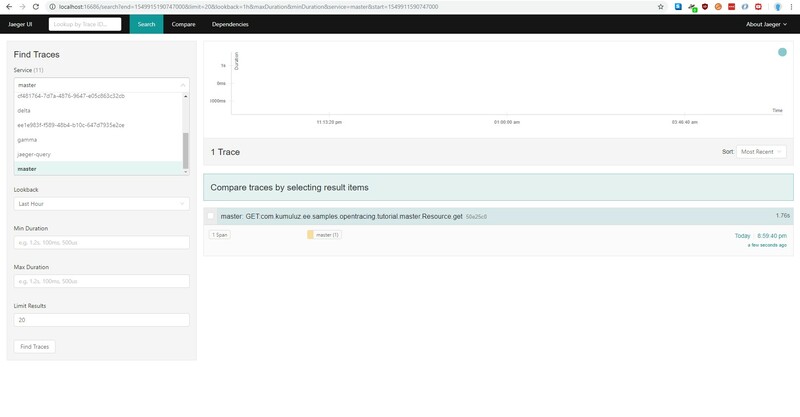 Cloned starting project from GitHub (https://github.com/kumuluz/kumuluzee-samples/tree/master/kumuluzee-opentracing-tutorial). Jaeger GUI is now accessible on http://localhost:16686. It consists of three main screens. 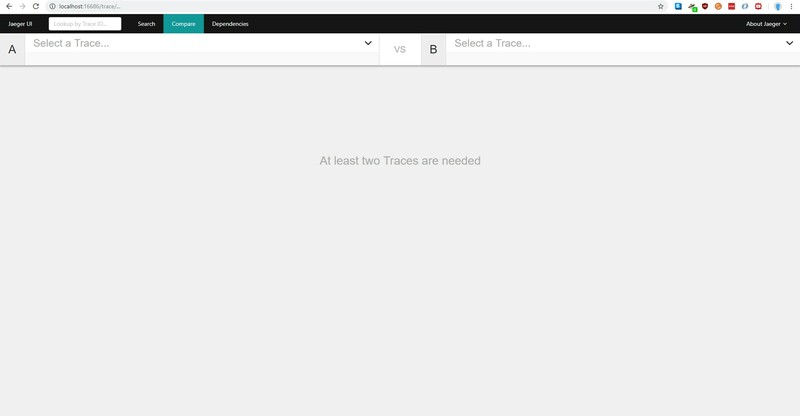 The first one is the »Search« tab, which enables searching through our traces with different criteria. 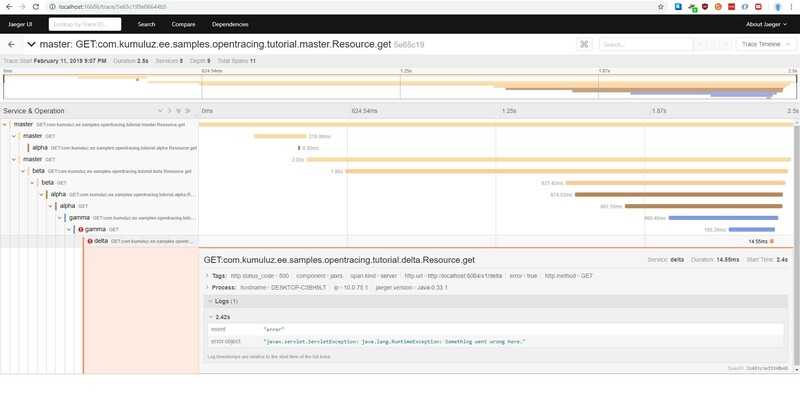 The second one is the »Compare« tab, which allows comparison of two spans. 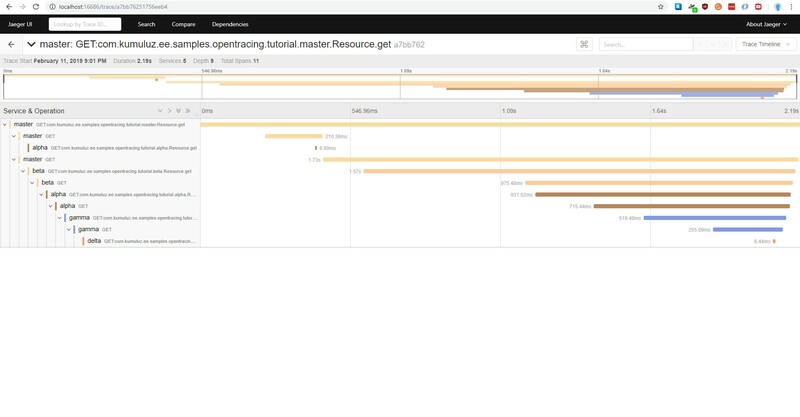 The last one is the »Dependencies« tab, which displays a graph of our microservices and their respective connections (not shown due to being an empty page). Right now, we have no data. Sample data can be added by exploring the GUI because Jaeger adds its own traces. We can now open one trace. master - This is the entry point of the application. It is served on http://localhost:8080 (actual endpoint on v1/master). When queried, it makes two requests: to alpha endpoint v1/alpha and to beta endpoint v1/beta. alpha - This is the first of 4 “slave” microservices. It is served on http://localhost:8081 and has two endpoints: /v1/alpha (just returns value) and /v1/alpha/beta, which queries gamma endpoint v1/gamma. beta - This is the second of 4 “slave” microservices. It is served on http://localhost:8082 and has one endpoint: /v1/beta, which queries alpha endpoint /v1/alpha/beta. Simulated lag is added to this request (random delay). 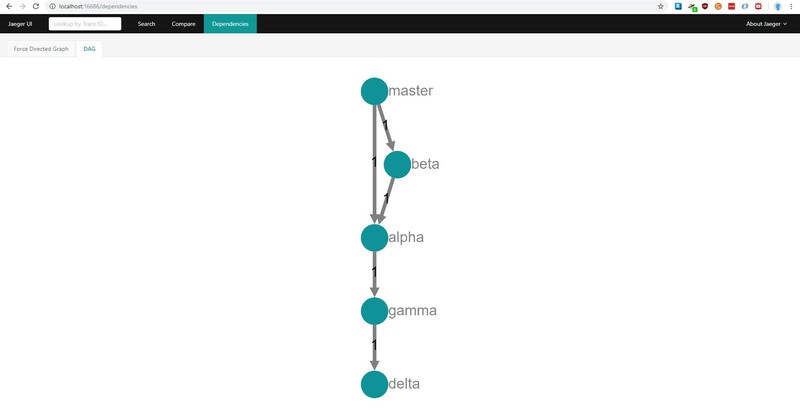 gamma - This is the third of 4 “slave” microservices. It is served on http://localhost:8083 and has one endpoint: /v1/gamma, which queries delta endpoint /v1/delta. This microservice is different, because it uses a simulated database with CDI. delta - This is the last of 4 “slave” microservices. It is served on http://localhost:8084 and has one endpoint: /v1/delta, which just return a value. This needs to be done for all microservices. At the time of writing this blog the latest version of KumuluzEE OpenTracing was 1.0.0. You don’t need to add the version manually because the version is defined in the root pom as a variable and will be used automatically. Just by adding this dependency, tracing is automatically enabled on all JAX-RS incoming requests. 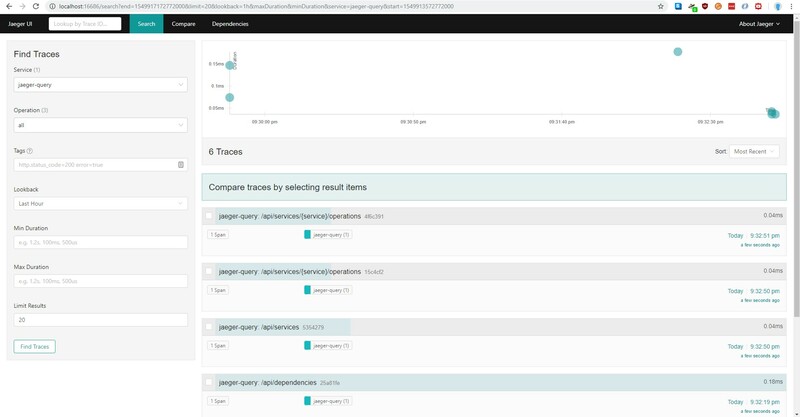 To see how this looks inside Jaeger GUI, simply visit the master endpoint in your browser: http://localhost:8080/v1/master. After the page loads, we can see if any traces were added to Jaeger. There are several other settings available, but we do not need them for this sample. For more information about other settings, check the KumuluzEE OpenTracing GitHub page (https://github.com/kumuluz/kumuluzee-opentracing). If we open this trace, we can see the whole request with all the microservices in one. Adding custom spans (such as database access). We can see from the trace that exception was added to the trace as a log. We will cover adding logs in the next section. Choosing a method of storing custom data is up to the developer. Tags are often used for storing metadata information (such as IP addresses, span types, versions, etc. ), logs are used for storing messages (such as exceptions) and baggage is used for storing data, which can be retrieved later with method getBaggageItem(). The final thing we will do in this guide is add tracing to functions outside of JAX-RS. This way we can include methods and functions that are outside of a REST service to the distributed trace. Typical examples are calls to the database, calls to external applications using protocols other than REST services and similar scenarios. To demonstrate this, we will show how to add calls to the database. 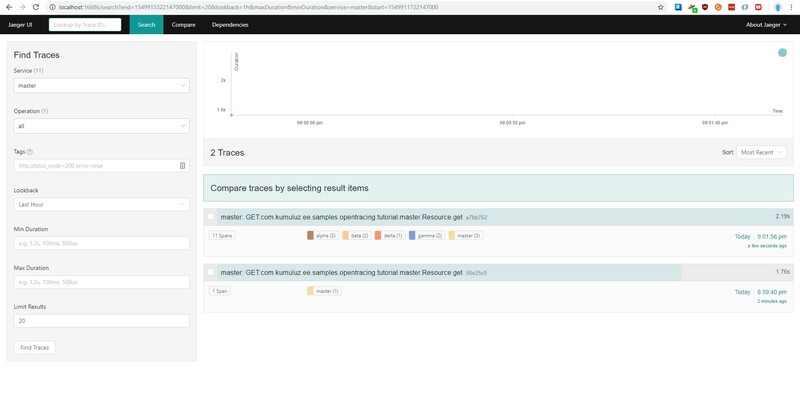 We have implemented a simulated database in our gamma microservice. The easiest way to add custom spans is to use the @Traced annotation and put it on the class. This way, all the methods will be traced. This annotation can also be used on a single method if we want to trace only a specific method inside the class. It is also possible to annotate the class and then disable tracing on methods by annotating them and set property value to false. Annotating and setting value to false can also be used to disable automatic tracing of JAX-RS incoming requests. We could achieve the same thing by injecting a tracer and manually creating the span. This is used when a developer wants a more fine-grained control over created spans. That way, more that one span can be created inside one method. In this article, we have demonstrated the basic principles of distributed tracing for microservices. 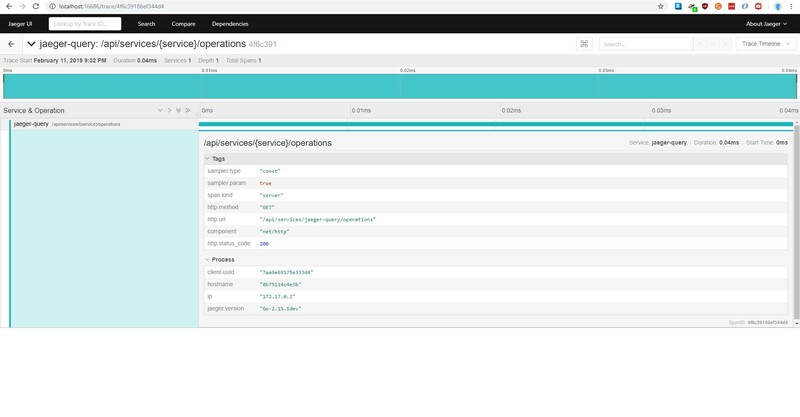 We implemented tracing of an existing application using the KumuluzEE OpenTracing extension. We did not need to write a lot of code. We only changed a few lines and added some annotations. 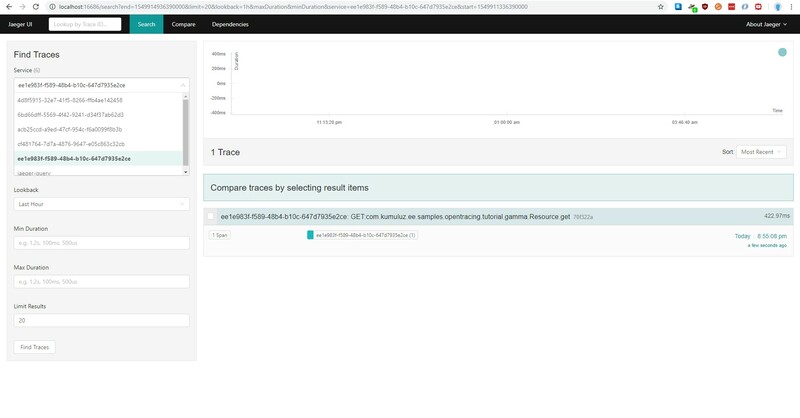 This shows how simple it is to add distributed tracing to your existing microservices and get all the benefits of distributed tracing such as tracing requests through entire network of microservices and easier pinpointing of slowdowns. Even though we covered basics of tracing, we left a few things out. For example, we did not include integration with MicroProfile Config extension and KumuluzEE config frameworks, which would allow additional tracing configuration such as ignoring tracing on JAX-RS endpoints and changing the way that spans are named. We have explained more advanced features only briefly but would suggest the reader to dig deeper into OpenTracing if they plan to use it in real-world applications. We also used the basic Jaeger configuration, ran all-in-one Jaeger and skipped most of the configuration. Running Jaeger as all-in-one is not recommended in production. For that reason, Jaeger components can be run separately (agent, collector, query and ingester). We did not cover any of the Jaeger specifics in the article, so we refer the reader to the Jaeger documentation for more in-depth guide on how to run Jaeger in production. Thank you for reading and stay tuned for the second part, which will cover the Zipkin tracing.